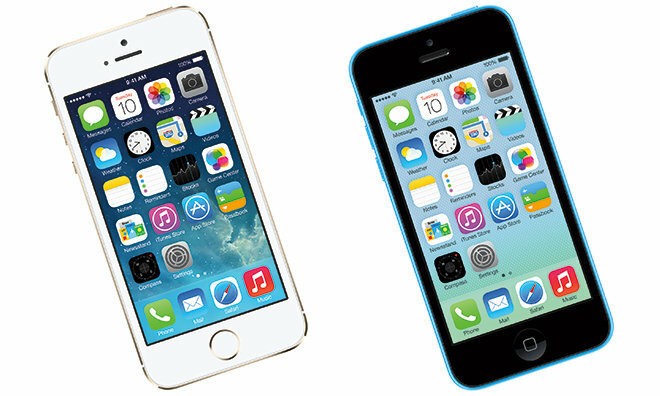 Apple's 4-inch iPhone 5s (left) and iPhone 5c were the last models to sport 4-inch displays. According to hit-or-miss publication DigiTimes reports Apple's 2015 iPhone lineup will consist of the usual "S" designation, which brings evolutionary changes like processor speed bumps, alongside a brand new "C" class. Industry sources are reportedly referring to Apple's supposed next-generation 4-inch device as the "iPhone 6C," a take on the low-end, polycarbonate-bodied iPhone 5c that debuted in 2013. As an entry-level product, the 6C is rumored to run on current generation A8 system-on-chip silicon, while the 4.7-inch and 5.5-inch iPhones will run an unannounced A9 chip. All models will get NFC, Touch ID fingerprint recognition and Gorilla Glass-covered low temperature polysilicon (LTPS) panels like those seen in the current iPhone 6 series, the report said. Apple partner suppliers Japan Display and LG will provide stock for iPhone 6, iPhone 6S Plus and iPhone 6C, while Sharp is said to help out with iPhone 6S Plus. Finally, the publication said Wistron is expected to manufacture the iPhone 6C, while Foxconn and Pegatron handle high-volume 6S assembly. Rumors that Apple would return to the 4-inch form factor first surfaced in December, when analyst Timothy Arcuri said the device may come with purpose-built components to alleviate manufacturing costs. Although Apple's big-screened iPhone 6 and 6 Plus were extremely successful, helping move 74.5 million iPhones over the fourth quarter of 2014 alone, some longtime users were put off by the move to larger display sizes. Even as a "budget" model, a next-generation 4-inch iPhone could satisfy customers who want the latest hardware, but not at the cost of device size.